The first print adaptation of a Doctor Who television story (Doctor Who in an Exciting Adventure with the Daleks by David Whitaker) was released in 1964 by Frederick Muller Publishing. In 1973, Target Books, a division of the W.H. Allen publishing house, secured rights to reprint this and two other 60s novels, and thereafter started commissioning and publishing new Who novelisations, beginning a successful range that would continue for over 20 years and see more than 13 million books sold worldwide. In the late 80s, Target/W.H. Allen were taken over by Virgin Publishing, but the release of new novelisations (and reprinting of old ones) continued until the supply of available "classic series" stories finally ran dry in 1994. The following is a list of all 156 classic series novelisations, numbered as per their order in the "Doctor Who Library" (a numbering scheme devised in the 80s). Many of the books exist in a variety of different editions, cover designs, and even languages (some being released as far afield as Brazil, Turkey and Japan). If you're looking for a novelisation of a specific story, be aware that several of the early novelisations have different titles from the TV story they were based on — for example, Doctor Who and the Auton Invasion is an adaptation of Spearhead From Space. In cases like this, the below list contains the original TV title in brackets after the book title. 5 classic series TV stories were never novelised by Target due to contractual issues: The Pirate Planet, City Of Death, Shada, Resurrection of the Daleks and Revelation of the Daleks — however, in the 1990s/2000s, all 5 were unofficially published as non-profit fan novelisations by the New Zealand Doctor Who Fan Club, Meanwhile, between 2012 and 2019, BBC Books finally released "official" novel-length adaptations of Shada, City of Death, The Pirate Planet, Resurrection of the Daleks and Relevation of the Daleks, although these were not published under the Target imprint. In 2018, BBC Books launched a new Target Collection consisting of 4 novelisations of new series episodes, plus an abridged version of the City of Death novel mentioned above. These were published with the Target logo on the cover (the trademark is now owned by BBC Books' parent company Penguin Random House), however these novelisations are not numbered as part of the "Doctor Who Library", so are not listed on this page — for now at least! 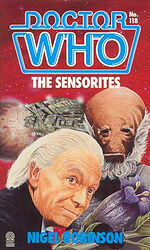 Two Tom Baker TV stories were also adapted by WH Allen in the late 70s as a separate range of "Junior Doctor Who" novelisations, aimed at 5-8 year olds: The Giant Robot and The Brain of Morbius. The experiment proved unsuccessful, so this range never continued beyond those two titles. The Paul McGann TV movie was novelised by BBC Books at the time of its broadcast in 1996. 4 novelisations of 11th Doctor episodes were released as part of the "Bug Club" children's literacy project in 2011: The Eleventh Hour, The Time of Angels/Flesh and Stone, Victory of the Daleks and The Lodger. A similar set of 6 "easy read" new series novelisations followed in 2018 from Pearson Publishing: Robot of Sherwood, Mummy on the Orient Express, Flatline, The Girl Who Died, The Woman Who Lived and Face the Raven. The 1981 special K9 and Company (pilot for a never-produced series) was novelised in 1987 as part of the short-lived Companions of Doctor Who novel series. Spin-off series The Sarah Jane Adventures had a total of 13 novelisations published during its 2007-2011 run. To date, none of the other Doctor Who spin-off series (Torchwood, K9 and Class) have had any of their episodes novelised. Final note: Many of the 1970s titles underwent multiple reprints over the years, sometimes with small differences to the cover design (for example, the Target logo changed from colour to monochrome in the early 80s). These reprints are not exhaustively listed here, but if you're interested to delve that deeply, there are two excellent resources I can recommend — The Target Book by David J Howe (published in 2007) and the downloadable e-book Based on the Popular BBC Television Serial by Paul Smith, first published in 2016.